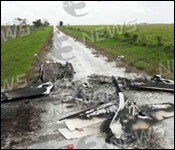 Turning now to other news, another drug plane has landed in Belize - and when police found it yesterday, not much was left; it had been burned to nothing. This one landed in the northwestern Orange Walk District, near Tres Leguas - a very short distance from Mexico - we are told. Police say they visited a farm road about 18 kilometers Southeast of Blue Creek Community, and found the charred remains of a single-engine aircraft. Nearby police found 3 aircraft seats, three 50 liter containers and twelve 20 liter containers full - but full of aviation fuel. We are told these items were concealed in the bushes - along with landing lights. But no one was found in the area - and police don't have much to go on - as to whether it was dropping off or picking up drugs.